It is that time of year again. Tree lighting ceremonies and Nutcracker shows are popping up all over the city. And, of course, we’ve got more Holiday Train adventures to see. This week, we’re heading up to the Bronx for our first tree lighting of the season and heading to Washington Heights for a new twist on the Tchaikovsky’s Nutcracker. We’ll also explore Alice in Wonderland through the poems and spoken word of contemporary artists at the NY Public Library and listen to the sounds of Duke Ellington at Symphony Space. There are lots of activities to take part in this week. Here are our picks for the week ahead. Get ready to light up the holidays. On Thursday, November 19, the Bronx Terminal Market will host its third annual tree lighting ceremony. Although it’s not quite winter yet, the Bronx will get a taste of a man-made winter wonderland a little early. The event will feature two trees that contain over 100,000 LED lights. You’ll be able to see them on the pedestrian bridge near Michaels. The event will begin at 6PM. Families should get there a little early to partake in complementary hot chocolate, giveaways, interactive performances and photo opportunities with Santa. The event runs through 8PM. Every year, around the holidays, families in NYC have the chance to view a myriad of Nutcracker performances. Some families look for a more classic look at Tchaikovsky’s famed score, while others search for more contemporary twists on the fabled story. If you’re looking for a Nutcracker that is truly different, check out “The Hip Hop Nutcracker” at the United Palace Theatre. The show is collaboration between the UPCA and choreographer Jennifer Weber. This poetic reboot will be performed for two days only this week. Families with kids in middle and high school will enjoy the upbeat music, dance, a DJ, an electric violinist and new visual scenery (for those who saw the show when it debuted last year). Opening night is Friday, November 20 at 8PM. It will feature special guest Kurtis Blow. The second performance is on Saturday, November 21 at 2PM. Tickets to this show will benefit the UPCA’s Youth Arts Academy. Get ready for a dazzling blend of music, dance and martial arts. As part of the 2015 Next Wave Festival, Taiwan’s U-Theatre will present its Beyond Time show at the BAM Howard Gilman Opera House. Musically, the show features thunderous taiko drums, nomadic chanting, gongs and laughter to guide the performers’ dance and martial arts movements. Beyond Time incorporates digital projections of rainfalls, eclipses and full moons in shimmering blue light along mirrored floors to transport families to a distant world. Ticket prices start at $20. The show runs from Nov 19 to Nov 21. This is the US premiere so be sure to catch it. Show times are all at 7:30PM. The show is approximately an hour and fifteen minutes. The stories of Alice’s adventures in Wonderland were first published in the late 19th century. Two hundred years later, the world has had the chance to digest a variety of interpretations of Alice’s famed adventures. On Thursday, November 19, the New York Public Library for the Performing Arts will take a new look at Wonderland. Miles Hodges and Alysia Harris, two of NYC’s poets and spoken word artists, will use their words, music and images to reinterpret the classic stories of Lewis Carroll. This is a great program for kids in middle school and high school who are looking for new ways to explore their literary talents. The event starts at 7PM. Some kids may look at jazz as a musical style reserved for an older generation. But that is not the case. On Saturday, Nov 21, Jazz at Lincoln Center will present “Jazz for Young People” at the Peter Jay Sharp Theatre at Symphony Space. The focus of this show is to explore the music of famed composer and pianist Duke Ellington. Young audience members will take part in interactive performances and lessons that follow Duke’s journey from Washington, DC to NYC. And then they will head down to New Orleans for the birth of jazz. This is a great show for families, which may also spark a new pastime. Show times are at 11AM and 1PM. The show runs for approximately one hour. This Saturday, families are invited to visit the Wyckoff Farmhouse Museum in Brooklyn for Farmhouse Family Day. This is a great chance to visit New York City’s oldest building and take your children around its surrounding 1.5 acres of farmland. What better way to enjoy a piece of neighborhood that was once the best farming community in the city?! The event runs from 11AM to 3PM. Families can take part in hands-on activities, scavenger hunts and other seasonal crafts. If the weather permits, you are welcome to bring picnic items to enjoy before or after you enter the house. This event is ideal for kids ages 3 and up. All aboard! Get ready for a miniature journey through NYC. 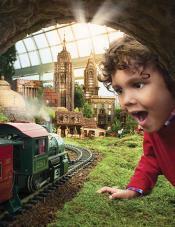 On November 21, the Holiday Train Show opens at the New York Botanical Garden. This year’s exhibit has been expanded to feature an additional 3,000 square feet of exhibition space. That means your kids will enjoy seeing more new trains, bridges, tracks and landmarks. There’s something nostalgic and dreamy about following G-scale locomotives around the Brooklyn Bridge, Statue of Liberty and Rockefeller Center, while enjoying every sight and sound in this multisensory adventure. The show runs through January 18, 2016. November 22 will be your last chance to see “White” at the New Victory Theater. This is the Drama Desk Award winning show for kids that is presented by the Catherine Wheels Theatre Company of Musselburgh, Scotland. In this show, specifically designed for younger audiences, kids will meet Cotton and Wrinkle. They are two careful custodians of a colorless world. While they diligently try to hide every hint of hue from the world, pops of color will constantly appear, throwing their orderly lives into a fun-filled frenzy. This is a whimsical play for kids ages 2-5. The chromatic set pieces are a delight to see. The show is floor seating only since it’s designed for young audiences. Tickets are all $20. The show runs for approximately 40 minutes.